2 Let’s start by discussing Hospital services. 3 What are Inpatient Services? Inpatient services are when a patient is admitted to a hospital, skilled nursing facility or immediate care facility for bed occupancy. Services include, but are not limited to, diagnostic or therapeutic services and medical and surgical services. When in doubt, remember…if the patient occupied a bed at midnight, it is an inpatient stay! 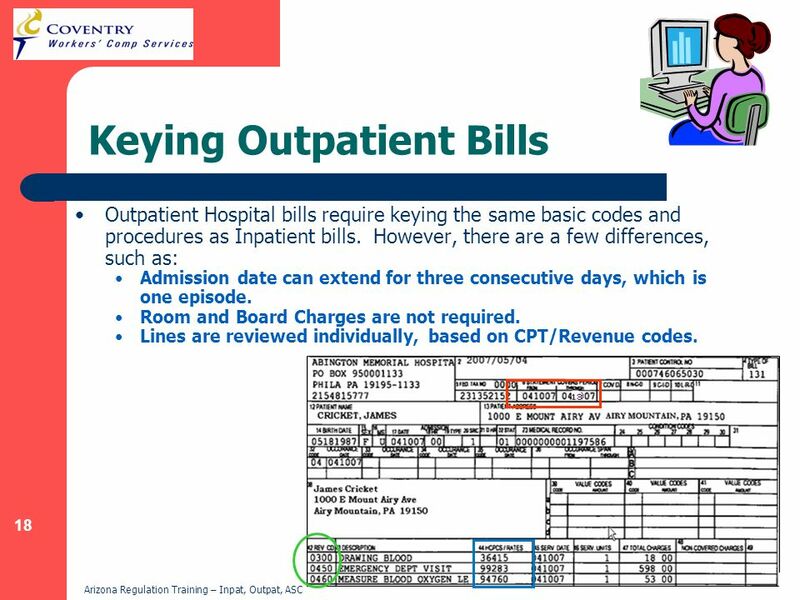 Next, there are Revenue codes that identify accommodations, ancillary services or billing calculations rendered in the hospital. 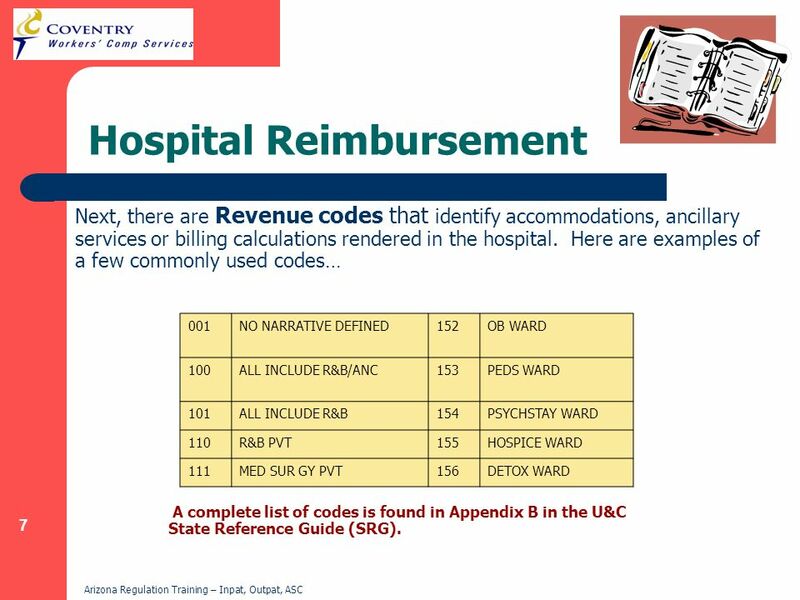 Here are examples of a few commonly used codes… 001 NO NARRATIVE DEFINED 152 OB WARD 100 ALL INCLUDE R&B/ANC 153 PEDS WARD 101 ALL INCLUDE R&B 154 PSYCHSTAY WARD 110 R&B PVT 155 HOSPICE WARD 111 MED SUR GY PVT 156 DETOX WARD A complete list of codes is found in Appendix B in the U&C State Reference Guide (SRG). Procedure codes identify types of services rendered to the patient. 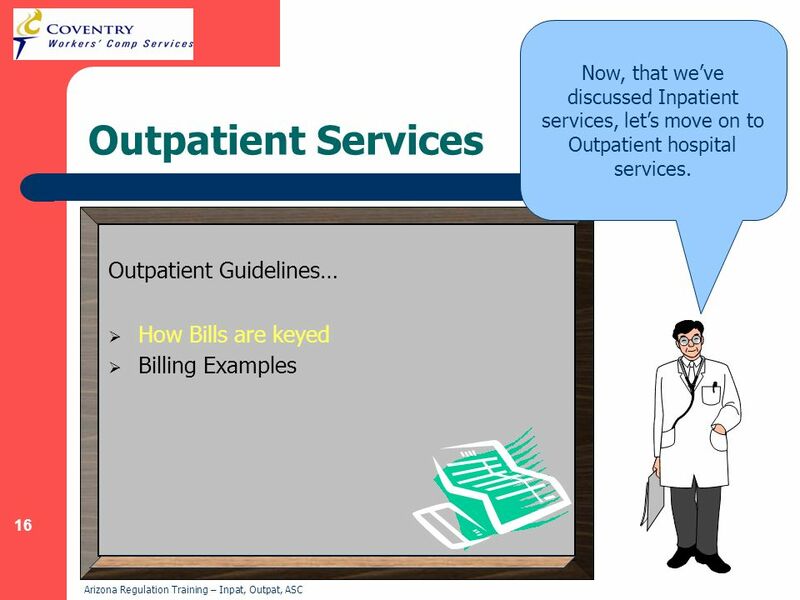 Inpatient and Outpatient services may be billed with one or two procedure types. These are Primary and Surgical Procedures. Although, the system is fully automated to recognize when one or the other or both procedures are required, here are examples in the event manual entry is needed. 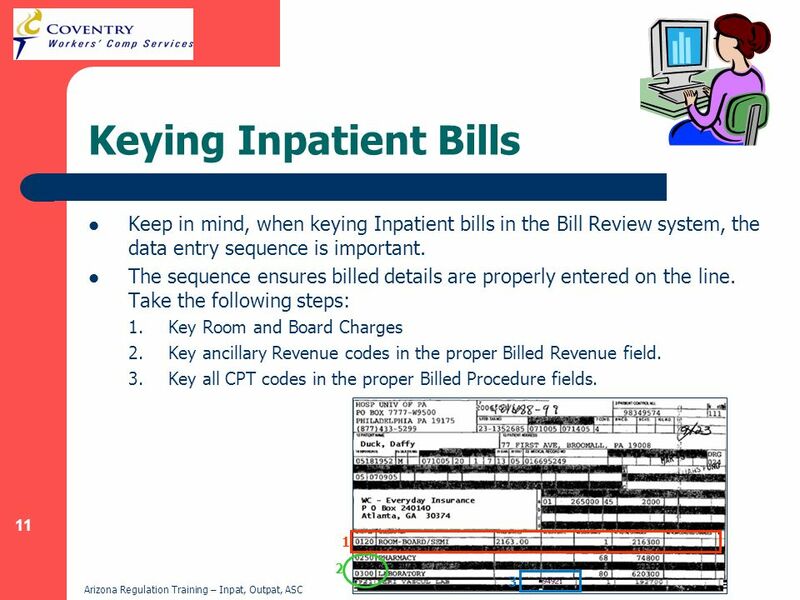 Primary Procedure : The primary procedure and procedure date must be keyed when included on the billing form. 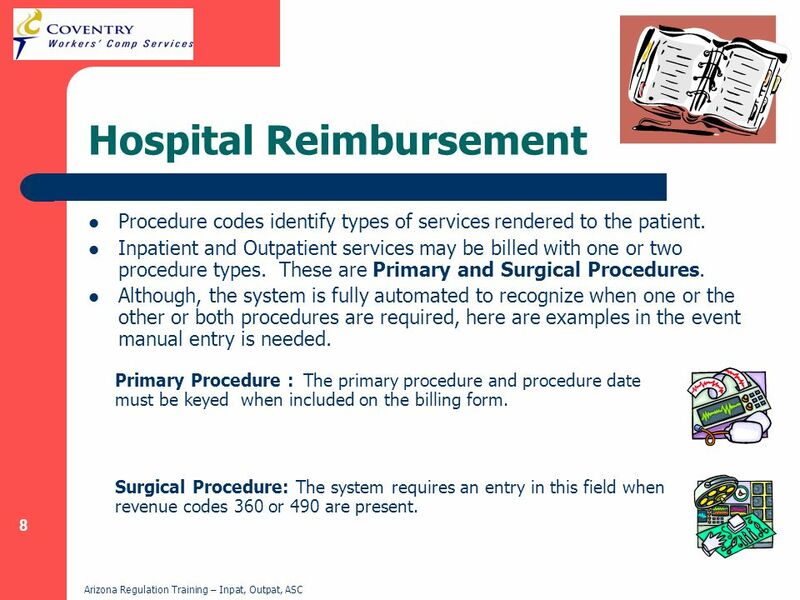 Surgical Procedure: The system requires an entry in this field when revenue codes 360 or 490 are present. 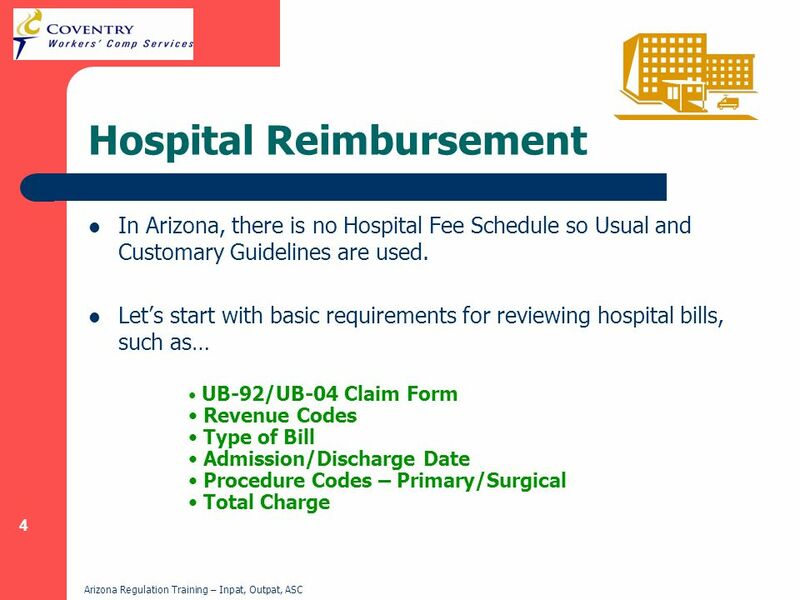 Additional factors in proper reimbursement are the Admission and Discharge dates of service. The Admission date starts the “clock” on the beginning of a patient stay or treatment. However, the date of admission is not always the date of service used on the detail lines. The Discharge date is an indicator of when the patient is released from a facility or treatment. 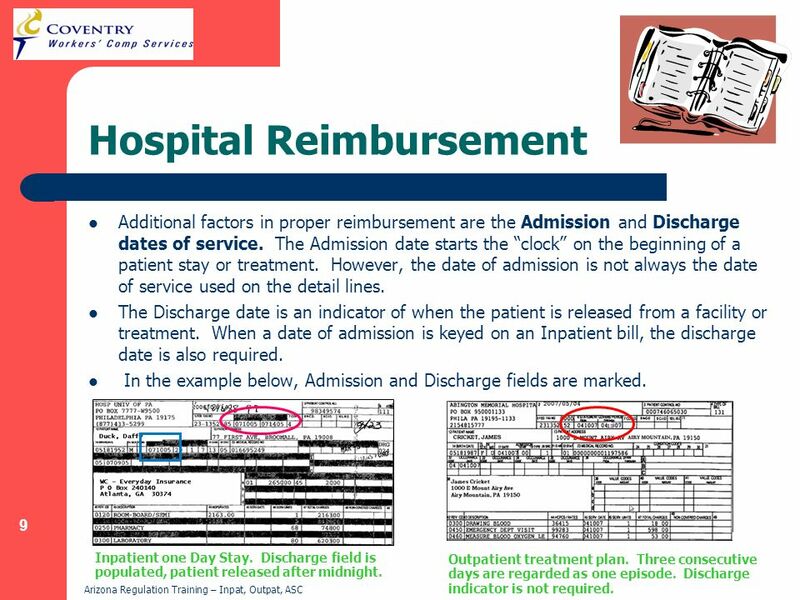 When a date of admission is keyed on an Inpatient bill, the discharge date is also required. In the example below, Admission and Discharge fields are marked. Inpatient one Day Stay. Discharge field is populated, patient released after midnight. Outpatient treatment plan. Three consecutive days are regarded as one episode. Discharge indicator is not required. 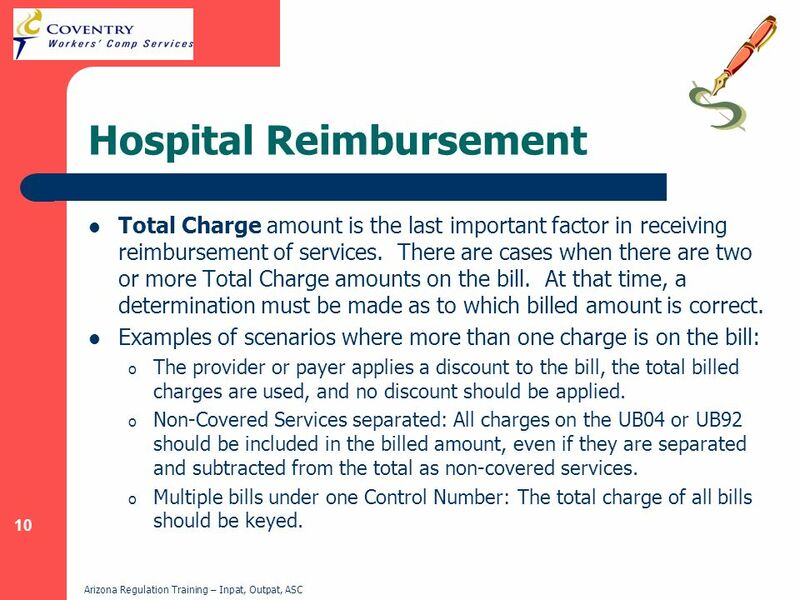 Total Charge amount is the last important factor in receiving reimbursement of services. There are cases when there are two or more Total Charge amounts on the bill. At that time, a determination must be made as to which billed amount is correct. Examples of scenarios where more than one charge is on the bill: The provider or payer applies a discount to the bill, the total billed charges are used, and no discount should be applied. Non-Covered Services separated: All charges on the UB04 or UB92 should be included in the billed amount, even if they are separated and subtracted from the total as non-covered services. 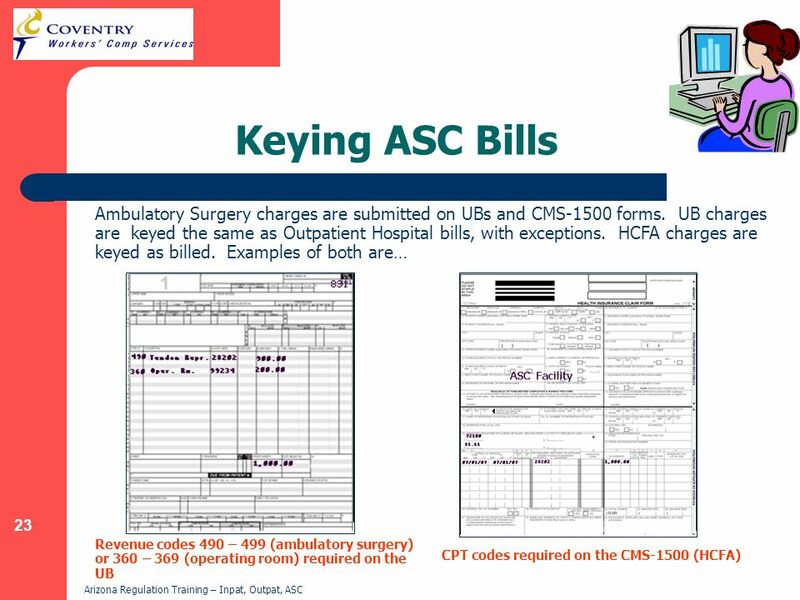 Multiple bills under one Control Number: The total charge of all bills should be keyed. 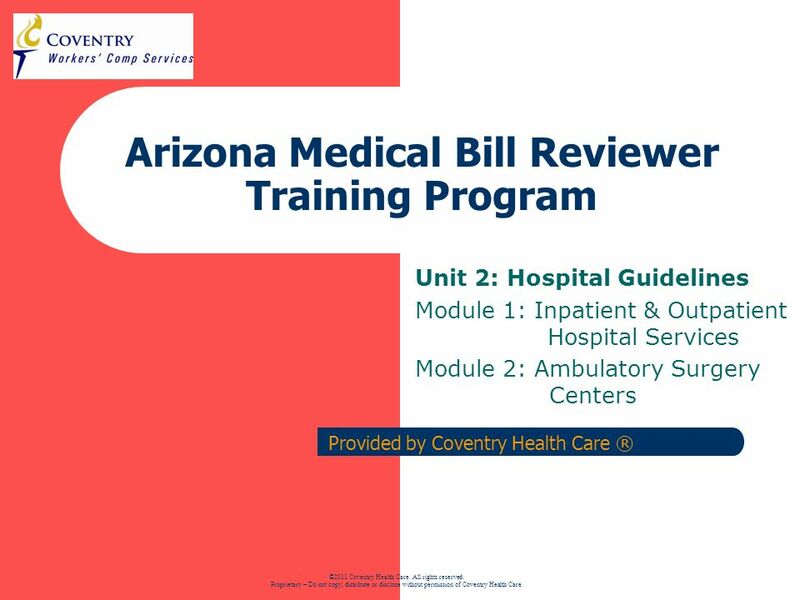 12 Trauma Reimbursement Trauma bills are recommended at 100% of billed charge. 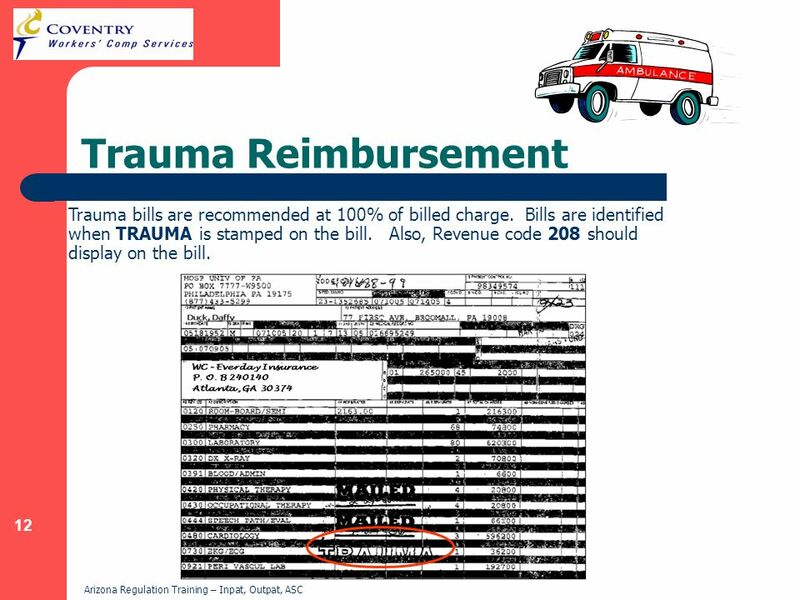 Bills are identified when TRAUMA is stamped on the bill. Also, Revenue code 208 should display on the bill. 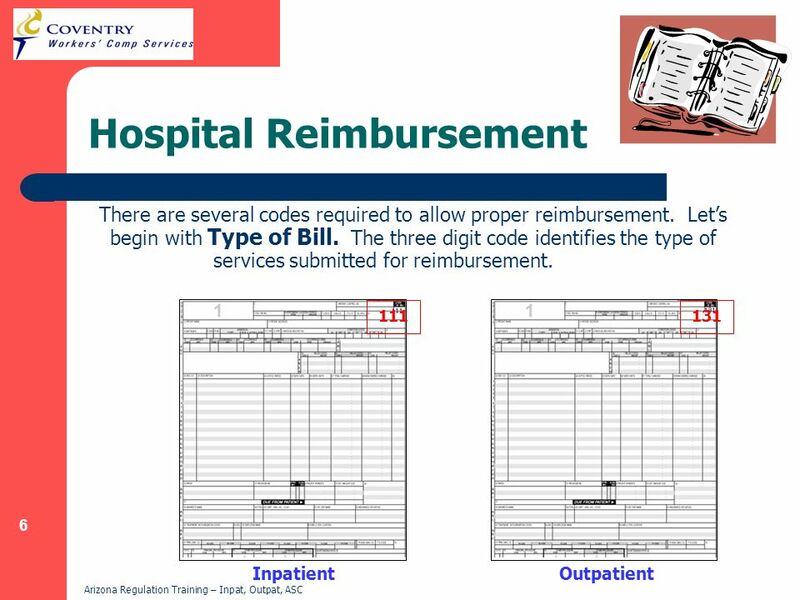 13 Trauma Reimbursement In Bill Review, trauma bills are identified when the Trauma field indicator displays Yes. 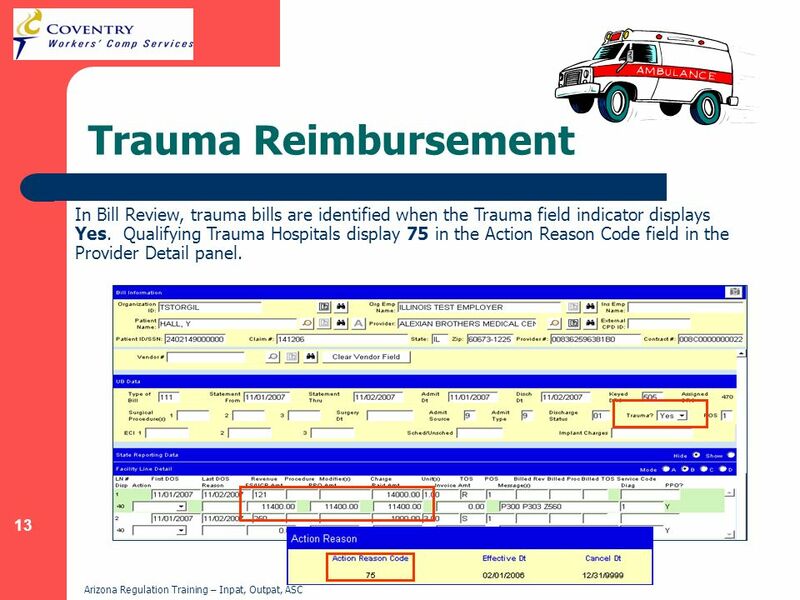 Qualifying Trauma Hospitals display 75 in the Action Reason Code field in the Provider Detail panel. 14 Implants Implants are tangible devises, hardware or instrumentations that are inserted into the patient during surgery. 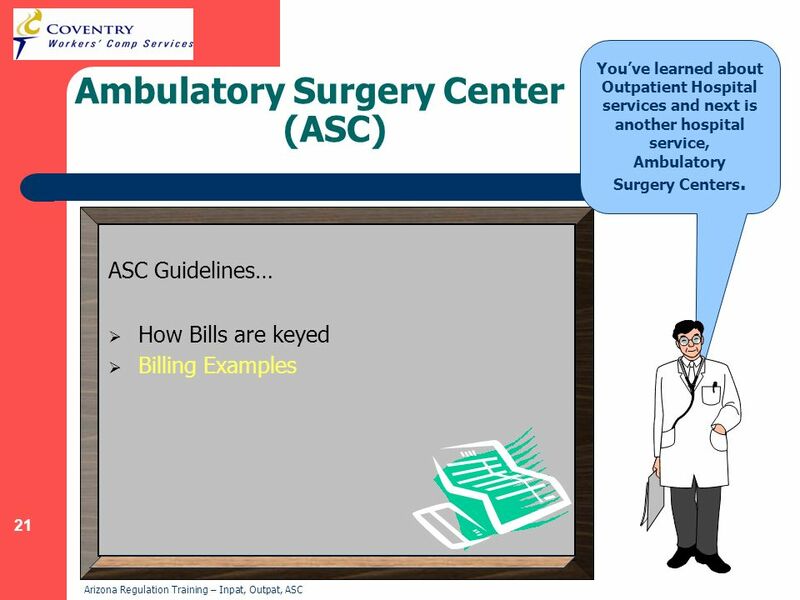 When this occurs, providers submit bills and documentation listing items used during the surgery. 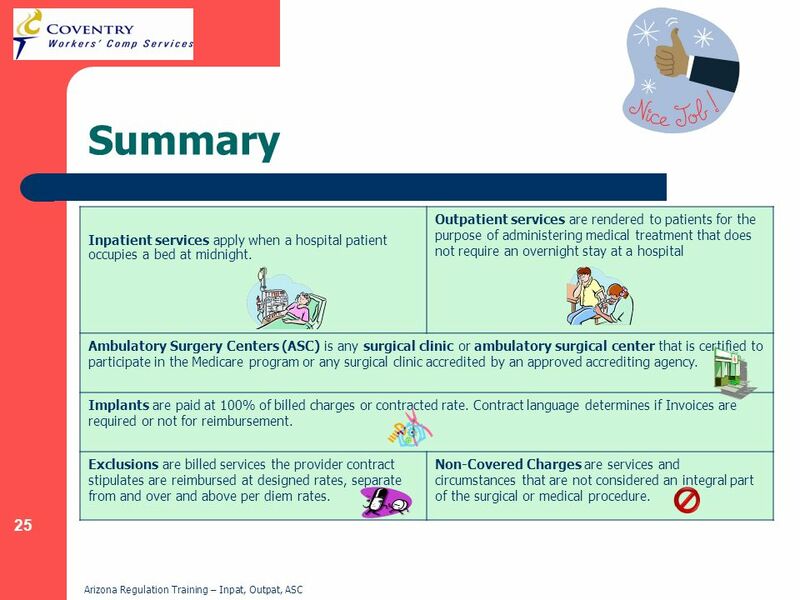 These services are considered separate from the surgical procedure, and generally allowed in addition to other facility fees. 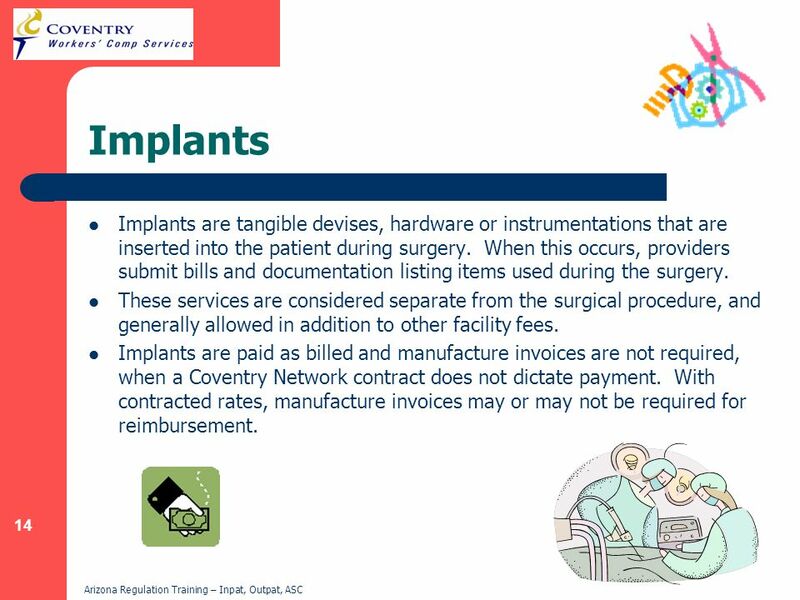 Implants are paid as billed and manufacture invoices are not required, when a Coventry Network contract does not dictate payment. 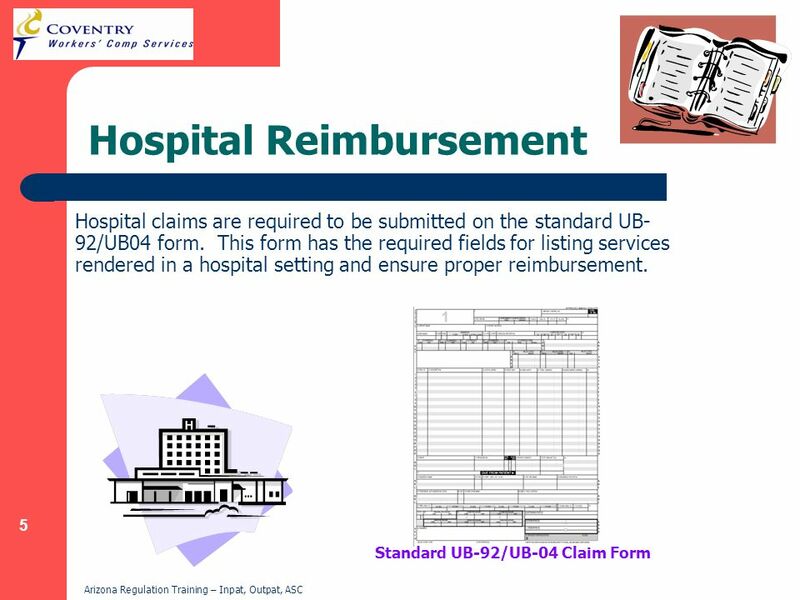 With contracted rates, manufacture invoices may or may not be required for reimbursement. 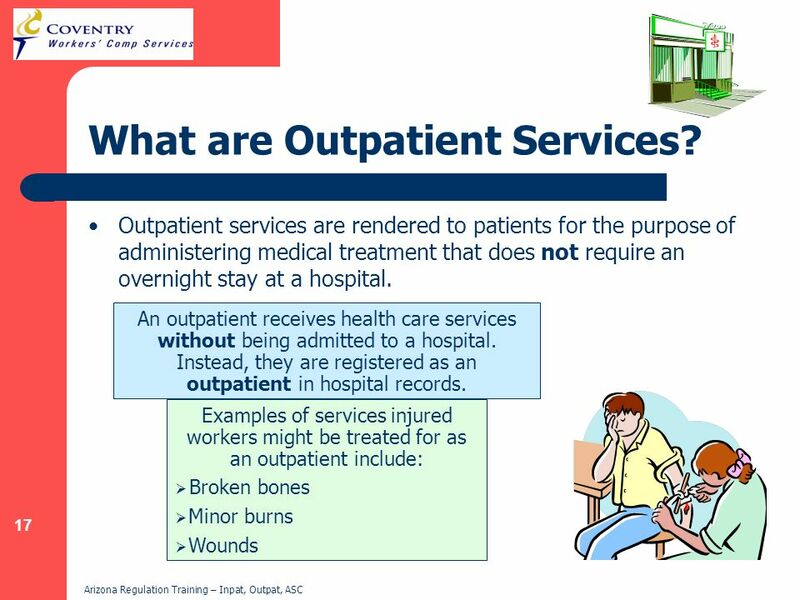 17 What are Outpatient Services? 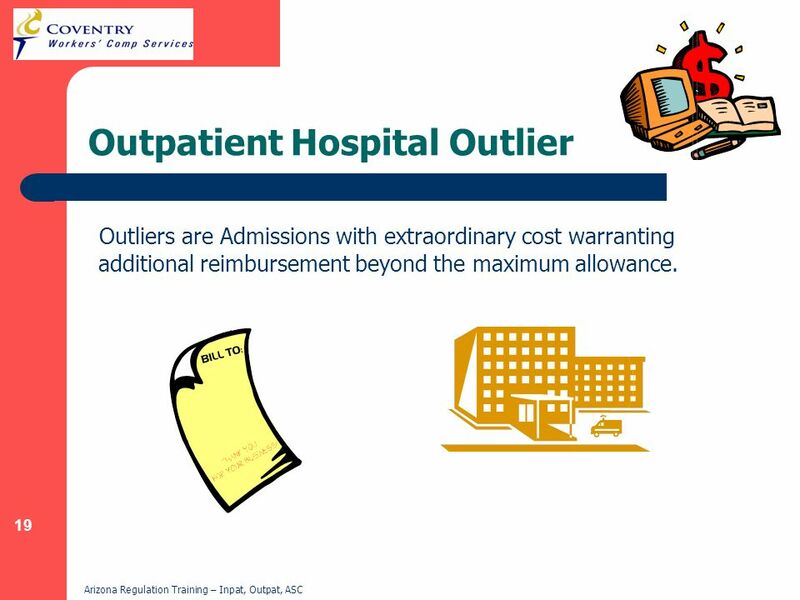 Outliers are Admissions with extraordinary cost warranting additional reimbursement beyond the maximum allowance. 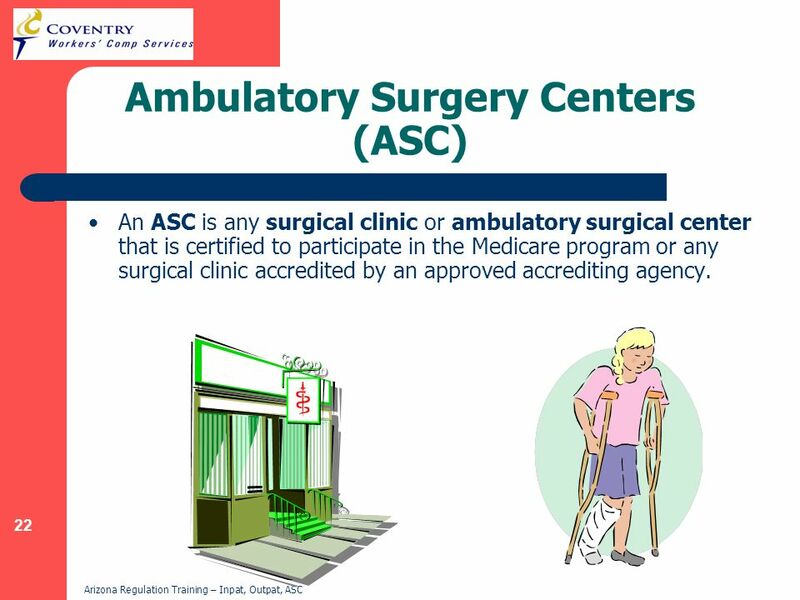 An ASC is any surgical clinic or ambulatory surgical center that is certified to participate in the Medicare program or any surgical clinic accredited by an approved accrediting agency. 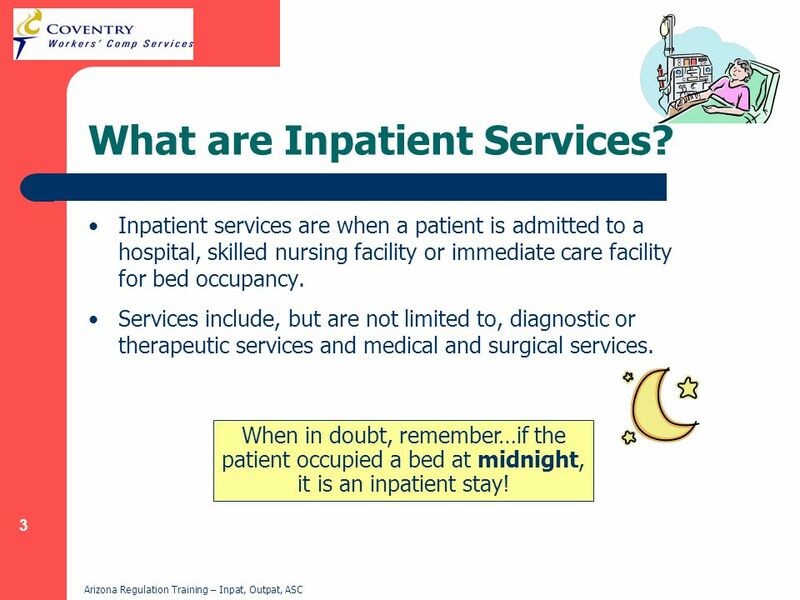 25 Summary Inpatient services apply when a hospital patient occupies a bed at midnight. Outpatient services are rendered to patients for the purpose of administering medical treatment that does not require an overnight stay at a hospital Ambulatory Surgery Centers (ASC) is any surgical clinic or ambulatory surgical center that is certified to participate in the Medicare program or any surgical clinic accredited by an approved accrediting agency. Implants are paid at 100% of billed charges or contracted rate. 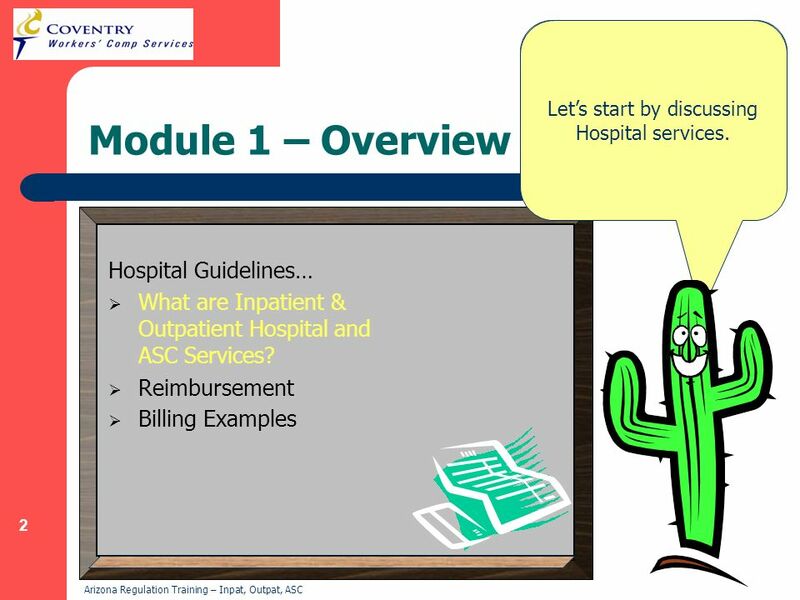 Contract language determines if Invoices are required or not for reimbursement. 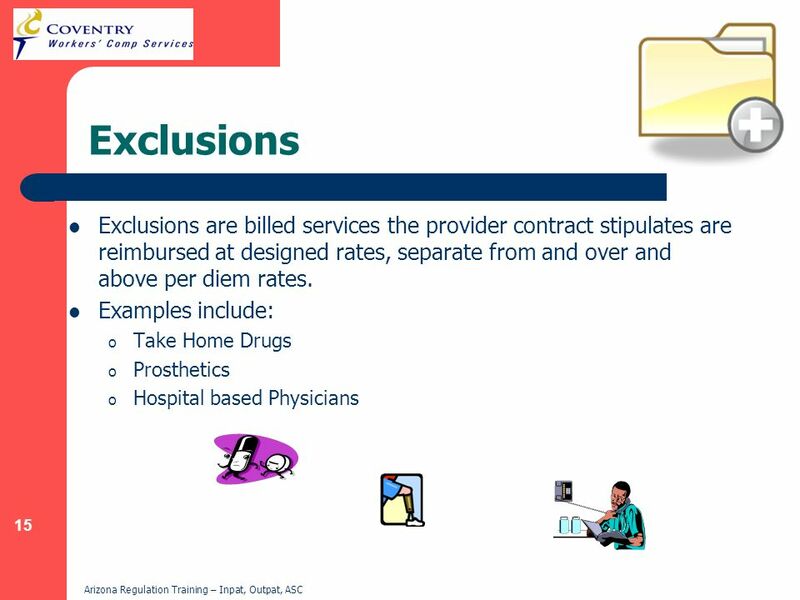 Exclusions are billed services the provider contract stipulates are reimbursed at designed rates, separate from and over and above per diem rates. 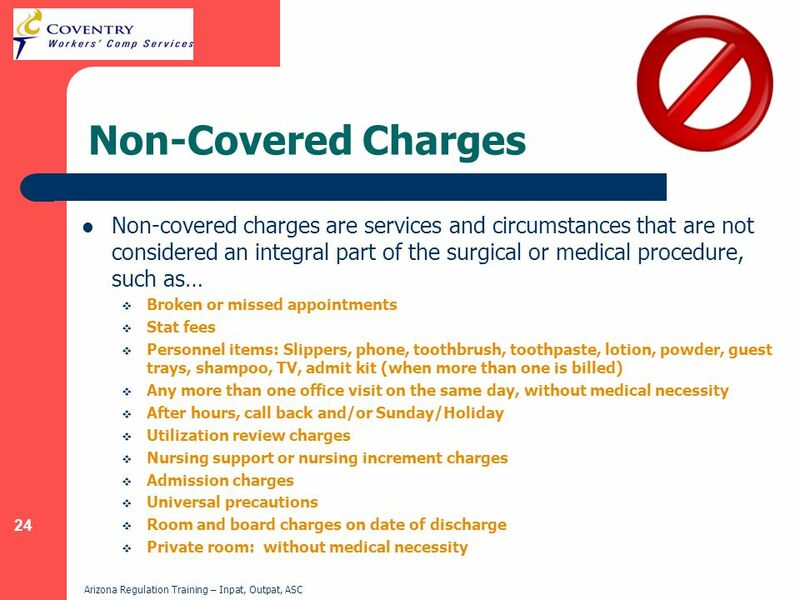 Non-Covered Charges are services and circumstances that are not considered an integral part of the surgical or medical procedure. 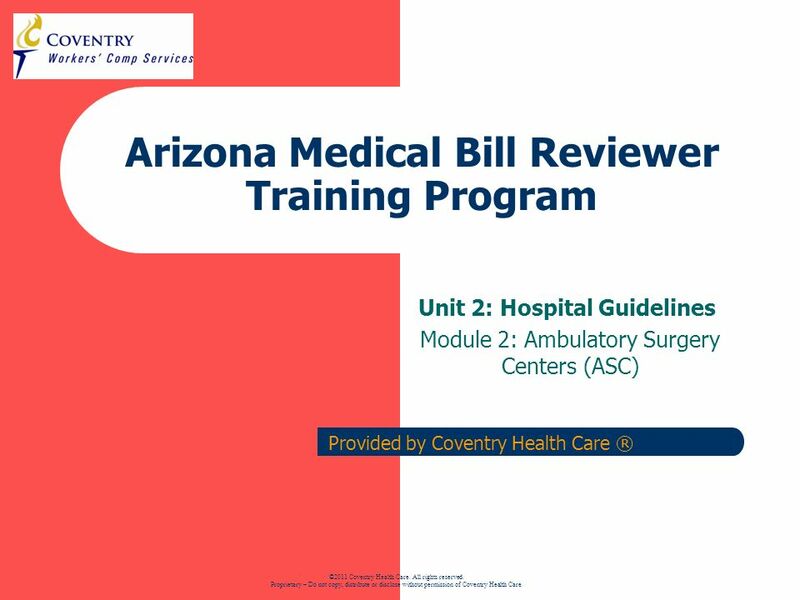 Download ppt "Arizona Medical Bill Reviewer Training Program"
© 2012 Cengage Learning. May not be copied, scanned, or duplicated, in whole or in part, except for use as permitted in a license distributed with a certain.